Sudan's government has agreed to allow some aid back into Darfur following its expulsion of humanitarian groups, US Senator John Kerry has said. But Mr Kerry stressed during a visit to Sudan that the partial resumption of aid would not be enough. Sudan expelled the aid groups after the International Criminal Court issued an arrest warrant for Sudan's president. A Sudanese official indicated that the expelled groups would not be allowed to return to Darfur. Mr Kerry, who heads the US Senate foreign relations committee, said after meeting senior Sudanese officials that "some... capacity for humanitarian assistance will be restored" in Darfur. But he added: "Today I emphasised, to all the leaders I met with, that a partial restoration of capacity is not sufficient. "Time is of the essence to avert a humanitarian catastrophe." Sudan expelled 13 foreign aid groups in March after the ICC issued an arrest warrant against Sudanese President Omar al-Bashir. Mr Bashir is accused of orchestrating atrocities against civilians in Darfur, where his government has been fighting rebels since 2003. The UN says that up to 300,000 people have died during the conflict and 2.7 million driven from their homes. Mr Bashir has dismissed the ICC's charges as a "neo-colonialist plot". 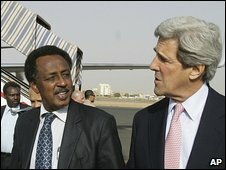 Mr Kerry's visit to Sudan came a week after a trip by US President Barack Obama's special envoy to Sudan, Scott Gration. He said he had been encouraged by "the fact that every member of the government told me that they are ready to come to the table now with respect to peace discussions and achieving peace in Darfur". "But we all recognized that the rebels must also do the same," he added. Mr Kerry did not say whether any of the expelled aid groups, which were accused by Sudan of spying for the ICC, would be allowed back in. But Sudan's ambassador to the UN said those organisations "were a closed file". "We've discussed with Scott Gration and John Kerry that the government can accept new humanitarian aid [organisations] -those who are committed to humanitarian ideals," Abdalmahmoud Abdalhaleem told Reuters news agency.